Surprise surprise! I have a Motivational Monday to share with you today. Like I mentioned before, I won't be doing these weekly anymore, but whenever I get a few submissions, I'll post them. Enjoy! 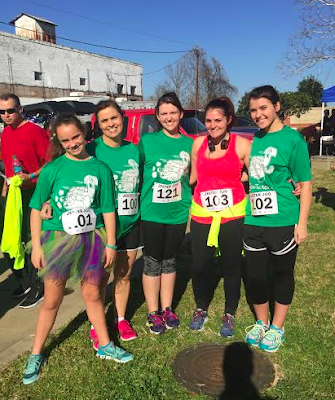 "Starting December 2014, my aunt, cousin, sister, and I decided to run a 5k each month for a year. We all started off not being able to run half a mile. My first 5k took over 46 minutes! But now, we have accomplished our goal, and we just can't stop! We are still running a 5k each month because we just LOVE it. We still aren't very fast (we call ourselves Team Tortoise), but we are improving! On Saturday I hit two big milestones! First, I PR'd (not counting the virtual 5k I did on the track) with a time of 30:38! Hopefully, I'll be in the sub-30 category next month! Also, I hit 149 pounds, so, according to my BMI, I am NO LONGER OVERWEIGHT! I still have 14 pounds to get to my goal weight, but this was a huge deal for me! (I have lost 57 pounds total). I just want to thank you again for your blog and your running plan! I had done C25K too many times, and it was so discouraging. My mom, grandmother, and three of my aunts have had gastric bypass surgery and I thought that I was on my way to having to do the same. Seeing that you were able to do it on your own really encouraged me, and now I even have people asking ME for tips. HOW WEIRD! I am the one in the middle, #121." "I actually was on a Motivational Monday post was back in 2013 (Motivational Monday #14!) with my mom after running our first 10K. Well, this past Sunday, I ran my first half marathon in Tallahassee, Florida! It was the hilliest course I have ever encountered and made for a very tough 13.1 miles. My grandmother passed away last month after a 7 year battle with COPD, so my mom sewed me a heart out of my grandmother's favorite pajamas to wear on my bib (see picture). Every time I wanted to stop, I'd just put my hand on that heart and keep running." A huge congratulations to Brittany and Julie Anna! Oh wow...these made me teary! Great job, ladies! These are both great! Congratulations to you both. Wow, I'm so impressed with both of you. Congratulations on your accomplishments. Go team tortoise! And that is so sweet, Julie Anna! Great idea! Congrats to both these inspiring women! Both of these stories are just awesome and inspiring! Thank you for sharing!! I loved the idea of having a physical reminder to touch and help you keep going. I'll have to keep that in mind. I am sorry for your loss, Julie Anna. I love BOTH of those stories. Brittany--I'm so jealous of you training and racing with your family. That sounds like so much fun! And Julie Anna, I know your grandma would be so proud of you! And thrilled to be the one helping you to keep going in a very tough race. 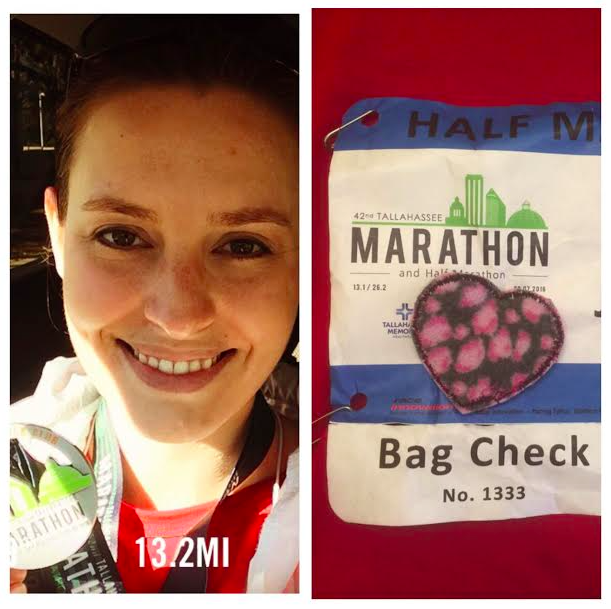 Congratulations on your half marathon! Thanks for sharing these stories! They are so inspiring!